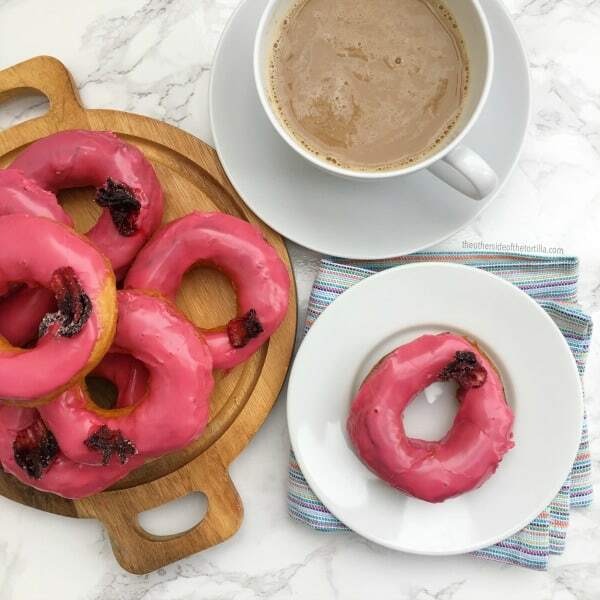 My love for Fany, breakfast and entertaining gave me the idea to make these doughnuts one lazy weekend, and they were so good, I shared a photo on my own Instagram account. Lots of people have asked for the recipe since I posted it, so I finally decided to write it out to share. 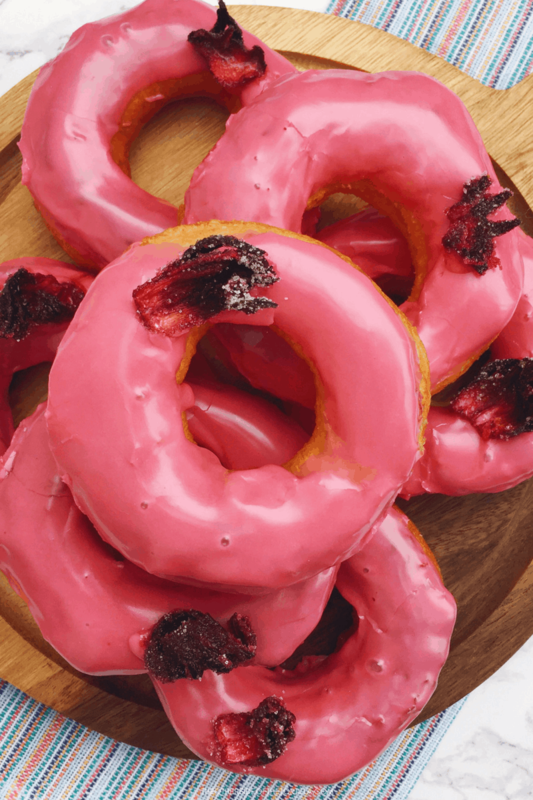 Of course, mine will not taste as good as hers, and if you find yourself in New York, head over to Dough in Brooklyn to check out all her fabulous doughnuts. But since I live on the opposite side of the country, I don’t make it to New York very often, so I have to improvise at home. The great part about these doughnuts is that if you’re not entertaining or you don’t have more than a couple people at home, you can just separate the dough and just make a couple at a time, and put the rest of the dough back in the refrigerator. The garnish is what really delivers the fanciness factor, and since you’ve already soaked the dried hibiscus flowers, all you have to do is roll them in a little sugar to make them look pretty, and they’re very easy to attach to the icing with just a little extra dab of icing on the bottom of the flower to help anchor it. And you can eat the garnish! I’ve made many cheater versions of doughnuts using the Pillsbury biscuits, but these are absolutely the best version and I can’t wait to host a brunch with friends to make a huge batch to share. Boil 1/4 cup of water in a microwave-safe measuring cup. Add 3 tablespoons dried hibiscus flowers to the water and use a spoon to push them completely under the water to steep. Set aside. While the doughnuts are cooling off a bit and draining excess oil, add 2 cups confectioner’s sugar to a bowl. Pour the hibiscus juice through a strainer into the confectioner’s sugar and set the flowers aside. Stir the confectioner’s sugar and juice until it’s a smooth consistency. Add 1/8 teaspoon of Mexican vanilla extract or pure vanilla extract and stir well to incorporate. The icing should be thick. Dip the tops of the doughnuts in the icing, twisting them slightly to ensure they’re coated evenly all the way around the tops. Place them on the parchment paper-lined baking sheet to dry. You should have leftover icing. In a small dish, stir 3 tablespoons granulated cane sugar and 1/8 teaspoon ground cinnamon together. Add some of the hibiscus flowers you set aside earlier and shake the dish a little to completely coat the pieces. Using a small spoon or your finger, stick a little dot of the leftover icing to the bottom of each piece of sugared hibiscus flower. Stick them to the top of your iced doughnuts for an edible garnish.